Wat Suwan Kuha is located at Mu 2 Tambon Krasom, about 9 kilometres from Phang Nga provincial town on Highway No. 4 (the Phang Nga – Phuket route). At Km. 30, there is a paved road on the right leading for 1 kilometre to the temple. Wat Suwan Kuha is known locally as “Wat Tham” – a cave temple. It is one of the province’s important temples due to its historical and archaeological background. The temple is located on a mountain with a number of caves. Among them are Tham Yai, Tham Chaeng, Tham Muet, and Tham Kaeo. Tham Yai is on the lowest level and decorated with ceramic tiles and crockery throughout its length. 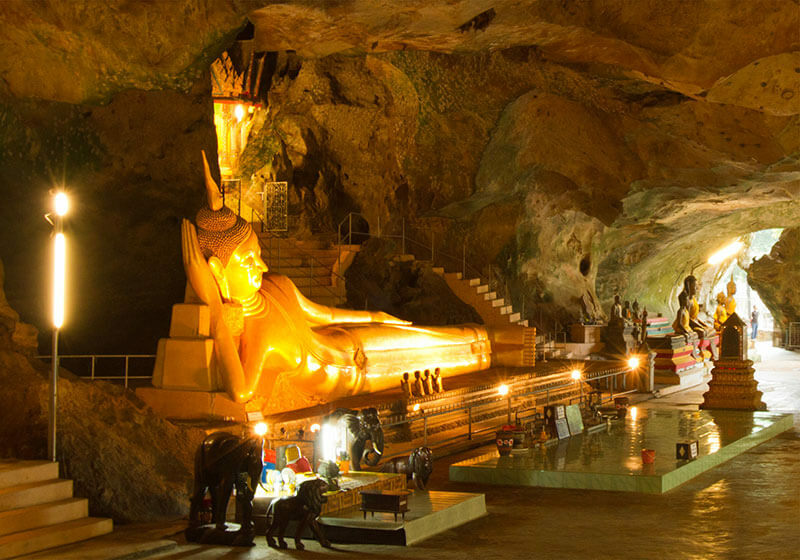 This cave serves as a wihan where several Buddha images are enshrined. The most important one is the Reclining Buddha. In another cave, there are royal initials of kings and members of the royal family, such as King Rama V the Great, King Rama VII and Queen Rambhaibarni, King Rama IX the Great, etc. The area in front of the cave is the feeding ground of a large number of monkeys.